Broccoli is definitely one of those “superfoods”, and I for one and just thrilled that my kids actually love it! I can’t stress enough just how loaded with vitamins and nutrients broccoli is! Such as, Vitamin C, K and A as well as folate, omega 3 fatty acids, beta carotene, iron, amino acids, calcium, and more! All of these nutrients are very important for our skin. They help to promote the growth of new skin cells, cleanse and detoxify the body, protect skin from aging, and even help keep your hair and nails healthy. 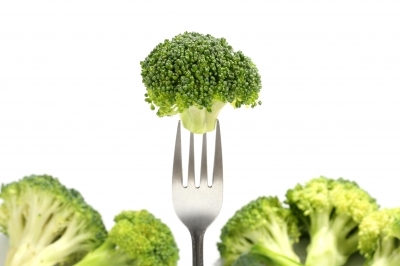 Eating broccoli is easy as a side, in a casserole, but best of course raw! Replace mayo with thick and creamy Greek yogurt — you’ll boost the protein content and won’t miss the fat. Instead of the traditional dressing made from mayonnaise, vinegar and sugar, mix yogurt with whatever vinaigrette you have on hand. I make a batch of homemade dressing on Sunday and use it all week-long. An olive oil-based dressing adds heart-healthy fat instead of the saturated kind you’ll find in mayo. The star of this salad is nutrient-packed broccoli. One cup has only 35 calories but is full of vitamin C, fiber, vitamin K and folate. Traditional broccoli salad recipes call for sunflower seeds to add a little crunch. They’ll add more fiber, protein and heart-healthy fat, too. Go for the roasted and salted kind – they are only lightly salted and have the most flavor. Another classic ingredient, a few raisins add sweetness and texture. It may seem like a weird combo of ingredients but they come together to create a delicious and unique side dish. A note about bacon: A hint of salty bacon would certainly be a welcome addition to this salad. Since 3 slices of cooked and crumbled bacon would only add 22 calories and 1.5 grams of fat per serving, it could be used as an optional sixth ingredient. In a small bowl whisk yogurt and vinaigrette until smooth. Add a tablespoon of water to thin it out slightly. Season with 1/4 teaspoon kosher salt and black pepper; set aside. In a medium bowl, combine broccoli, sunflower seeds and raisins. Top with dressing and toss well. Place in the refrigerator for at least 30 minutes before serving to allow the flavors to marry. One of the products I stock at Generation Green is “The Green Cream” from Clinical Luxury by Nature. 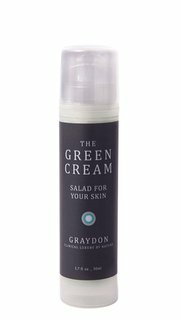 Graydon, the creator of this fantastic line of luxurious skin care products, markets The Green Cream as being “salad for your skin” and those words definitely caught my attention! Can you believe it’s loaded with broccoli! Not broccoli purée but broccoli seed oil. Bursting with serious anti-oxidant transformative power. Grown and cold pressed in Canada. Infused with an aromatic essential oil blend of parsley, sage, rosemary, thyme, and a hint of lemon. A natural product that is good for you too! You gotta love that!